Brilliant’s craftsmen know just how to show outstanding design a good time. More than just printing, it starts with our careful engineering, selection of the very best materials, state-of-the-art equipment, and infinite capabilities. We celebrate every project with expert care and precision from start to finish. This posh party favor designed by 160over90 for Mohawk was produced by Brilliant for the Mohawk Maker Quarterly 12 Launch Party. Front layer and back layer mounted on 50pt white board. Vibrant chartreuse hand painted edge. 118# Mohawk Strathmore Impress Pure Cotton Ultimate White Cover. 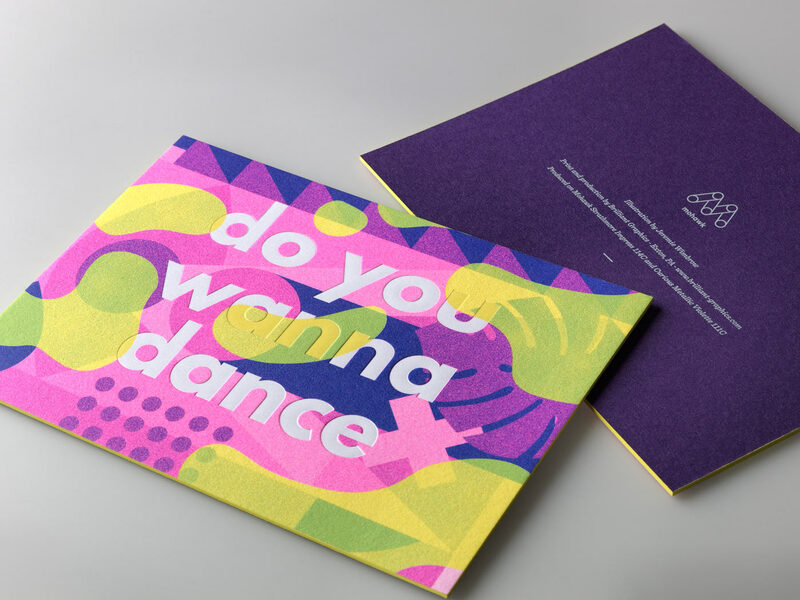 Printed digitally in four color process plus 3 hits of custom fluorescent pink. 111# Mohawk Curious Metallic Violet Cover. Printed offset with 3 hits of opaque white ink. Illustrated and designed by Jeremie Rose Wimbrow of 160over90, this piece was the life of the party. Brilliant precisely placed clear foil stamping on the front layer over the Ramones lyrics set in knocked out type. The relief is wonderfully crisp thanks to Mohawk’s newly released Strathmore Impress Pure Cotton Cover. Hand painted edges highlight our multi-layered approach: front layer printed digitally, back layer printed offset, both mounted to 50pt board. Our team ensured rich ink coverage with multiple hits of a custom florescent pink on the front layer, and the opaque white on the back layer. The back layer has the perfect touch of sparkle with Mohawk’s Curious Metallic Violet Cover. 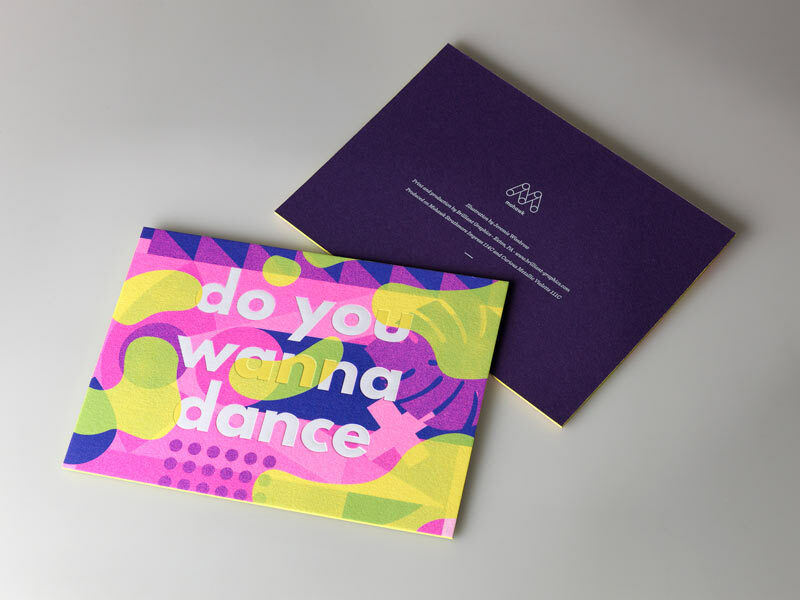 Trust Brilliant to make your next printed piece the life of the party.